The suitcase deadlift is a deadlift variation that can be done to increase total body strength, muscle hypertrophy (of the back, hamstrings, and glutes), and to develop greater movement patterning for real-world applications. In addition, the suitcase deadlift has been used more and more in competitive fitness WODs and competition, making it important to discuss proper technique, muscle worked, and more. Below is a step-by-step guide on how to properly set up and perform the suitcase deadlift. Note, that the suitcase deadlift is often done with one weight only (asymmetrically loaded), however can also be done with two weights, in which would be also known as a dumbbell/kettlebell deadlift. Step 1: Start by grabbing one dumbbell (or kettlebell) in your left hand. No weight should be in your right hand (unless performing a double suitcase deadlift variation). Note, that suing one dumbbell/kettlebell/barbell is generally what is meant by the exercise, suitcase deadlift. Step 2: With the weight to your side, stand erect and set your shoulder blades down the back, with the arms straight yet active. It is helpful to actively keep the weight off the sides of the hips by lifting them outwards about one-inch away from the body (this will also activate the back muscles). You can have your unweighted hand out in front of you for a counter balance if. need. Step 3: With the feet about hip width and toes forward, simply push the hips back and down, maintaining a flat back. The weight should stay inline with the center of the foot. Be careful not to let the chest and shoulders collapse forwards and/or the weights to move out in line with the toes. Step 4: As you approach the bottom of the deadlift, keep the chest high and core tight. This will ensure your lower back and torso are stable. Step 5: Stand up by lifting the chest and pushing the legs into the floor. Once you have completed a repetition, repeat for entirety of the set, then switch the weight to the other hand. The suitcase deadlift is challenging on the core muscles to resist any rotational forces due to the asymmetrical loading of this movement. When done with one weight, the core demands are much higher. The hamstrings, like most deadlifts, are primary movers in the suitcase deadlift. However, due to the lifter using a lower hip positioning in the pull (unless purposefully done with high hips), some of the loading is shifted for the hamstrings to the quadriceps. The quadriceps help to extend the knees and provide stability as the hamstrings work to extend the hips. Both muscles are active, however the more vertical the lifter can keep their torso, the lower the hips will be. This will result in the quadriceps becoming more involved than in a Romanian deadlift or stiff-legged deadlift variation. The back muscles contract to help stabilize the spine as the lifter is in the bent over position. Unlike the barbell deadlift, the suitcase deadlift forces a lifter to contract the lats and set the back to resist the loads from moving independently. The glutes work to extend the hips and stabilize the lifter as they descend into the deadlift. Much like barbell deadlifts, squats, and reverse lunges, the glutes are a primary muscle group involved in this lower body exercise. The spinal erectors (lower back) work to resist forward flexion of the spine in the suitcase deadlift. 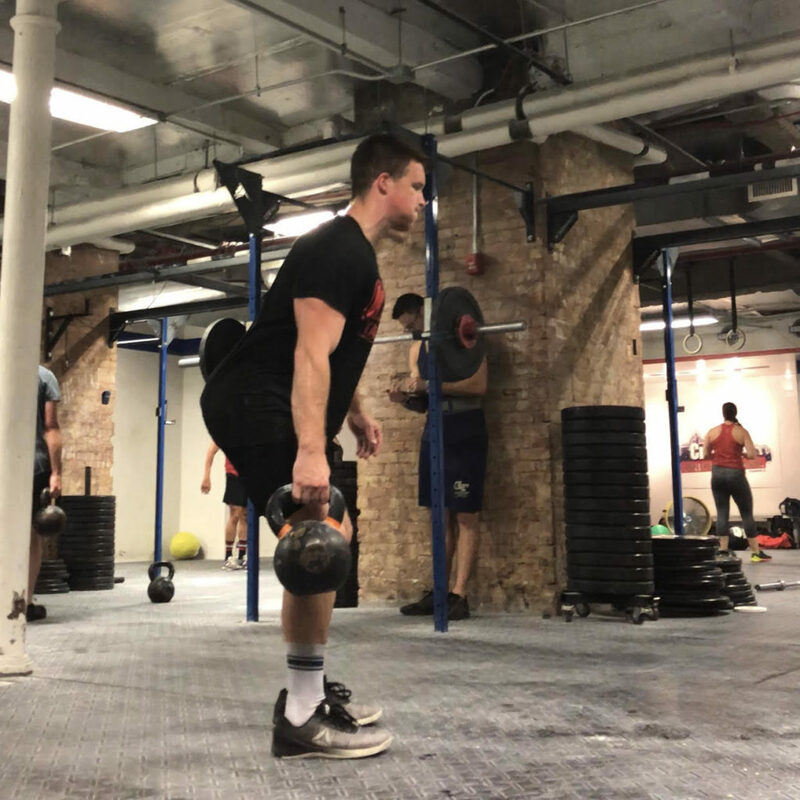 In addition to the upper back having to control and coordinate the dumbbells, independently, the lower back must aid in the spinal extension and isometric strength needed to resist the loads pulling a lifter’s balance forwards. Suitcase deadlifts offer coaches and athletes many of the same benefits as conventional, sumo, and trap bar deadlifts. With that said, the below benefits are specific to the suitcase deadlift, and can be beneficial for developing overall strength and movement that has direct application to the barbell deadlift. Deadlifting with asymmetries can cause performance decreases, muscle imbalances, and injury. The suitcase deadlift, done with either dumbbells, kettlebells, or barbells, can be a great way to add variety to one’s deadlifting training. In doing so, you can address and rotational movement issues (hips tracking back differently), unilateral strength and movement deficiencies, and total-body coordination due to the independent nature of each weight. Using dumbbells and/or kettlebells in the suitcase deadlift can help to add variety to the grip training and target the back slightly differently than a double overhead / mixed grip (often take with the barbell deadlift). Anti-rotational core strength is necessary for core stability during most strength, power, and fitness movements. By using the suitcase deadlift, the lifter can work to develop greater control of the torso, hips, and body as it works to coordinate both sides of the body, symmetrically, at once. This can have great application to more fixed deadlift versions with a barbell and can help to increase abdominal, oblique, and lower back muscle coordination and strength. Who Should Do Suitcase Deadlifts? The below section breaks down the benefits of the suitcase deadlift based on an lifter’s/athlete’s sport goals and abilities. The suitcase deadlift can be done to increase muscle hypertrophy and strength, improve movement coordination, and enhance unilateral strength and skill specific to the deadlift. Most strength athletes (powerlifting and strongman) should be well-versed in deadlifting and functional movements, like the suitcase deadlift, making this exercise a great moment to add to accessory and/or strength blocks. While this suitcase deadlift is not highly specific to the sport of Olympic weightlifting, it can be used in accessory segments and/or during corrective movement pieces to address any muscles imbalances, coordination issues, and/or add variety to muscle hypertrophy segments. The suitcase deadlift can be used for the above reasons (strength, muscle hypertrophy, movement), in addition to furthering one’s skill and comfort using dumbbell in competitive workouts. 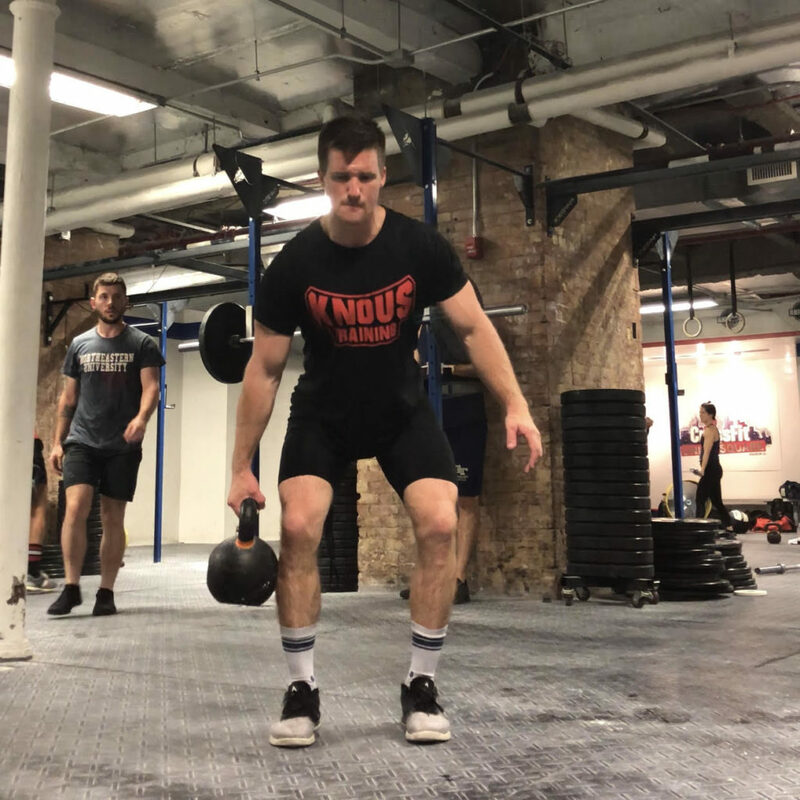 In the last few years, the dumbbell (and it’s wide variety of movements) has found its way into the CrossFit Open, Regionals, and Games, as well as a wide array of local competitions, making it vital for athletes to train with the dumbbell and its derivatives. The suitcase deadlift can be done to increase general strength, muscle mass, and enhance movement for all levels of fitness. For most beginner and intermediate lifters, this can be a good exercise to also address movement coordination and increase unilateral movement and strength. Below are four sets, reps, and weight (intensity) recommendations for coaches and athletes to properly program the suitcase deadlift specific to the training goal. Note, that the below guidelines are simply here to offer coach and athletes loose recommendations for programming. This should be done with a light to moderate load for moderate repetitions in a controlled fashion to instill proper control and coordination. If the goal is muscle hypertrophy it is key that a lifter performs this movement with moderate to heavy loads at a controlled tempo to increase time under tension. For more strength focused work, be sure to used moderate to heavy loads in still a moderate repetition range. Some lifters may want to train more repetitions to increase training volume, and muscle hypertrophy. The below rep ranges can work best for this type of goal. Below are three (3) suitcase deadlift variations that can be used by coaches and athletes to keep training varied and progressive. The deficit deadlift inherently places the lifter in deeper knee and hip flexion angles than a normal barbell deadlift due to the placement and size of the loads relative to the clearance on the floor. Coaches can perform deficit suitcase deadlifts to fully challenge and develop the lower back, legs, and back muscles and resolidify strong, functional movement. Lastly, the deficit suitcase deadlift can be done to increase glute, quad, and back strength. Either done with only one weight (other hand has no weight) or with two different loads in each hand, the asymmetrical deadlift is a good exercise to increase core stability (obliques) and pattern a balance and symmetrical deadlift (which may be limited by unilateral imbalances). The tempo suitcase deadlift can be done in a similiar format to most tempo exercises, in which the goal is to hold tension and positions for the allowed time period. This is good for developing muscle mass (time under tension), body control, and enhance positional integrity of the moment throughout various phases of the deadlift. Below are three (3) suitcase deadlift alternatives coaches and athletes can use to increase overall leg strength, address weaknesses, and build muscle. The trap bar deadlift is very similar to the dumbbell deadlift, so much that it can be used for similar muscle hypertrophy and positional strength goals. In our Trap Bar Deadlift Ultimate Guide, we break down the specific technique points you should master. The dumbbell reverse lunge can target the hamstrings, glutes and quadriceps. You can use this exercise to also address assysmtricies, muscle imbalances, and coordination issues. 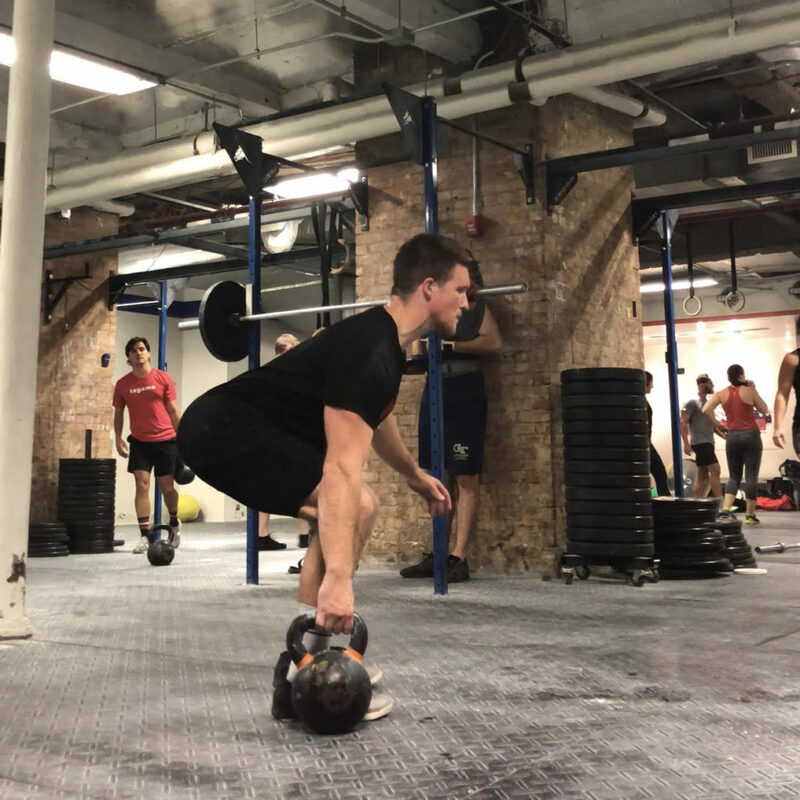 The deficit conventional deadlift, also referred to as a barbell deadlift, is done by standing on blocks, a plates, or another surface that is elevated. 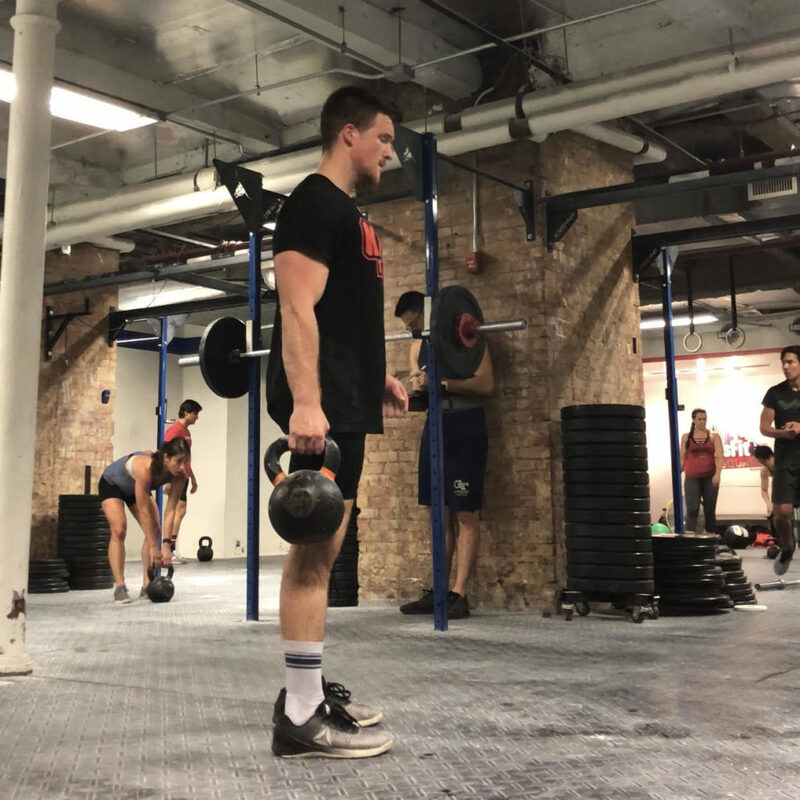 By performing the deadlift from deficit, the lifter must go into much deeper knee, ankle, and hip flexion and increase strength at deeper end ranges.